Home/Posts/G Suite or Office 365, which is best for your business? Google’s G-Suite or Microsoft’s Office 365? This is one of the toughest decisions for businesses who choose cloud-based platforms for business email and productivity tools. 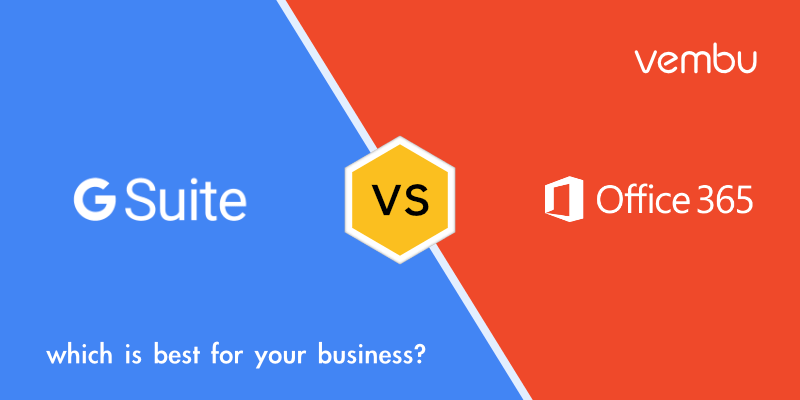 In this article, I will compare G Suite and Office 365 head to head and help you decide which one is better for your business. Depending on the current size of the organization, expected growth, ease-of-use, features, pricing, and other needs, what cloud platform one chooses may vary. So what actually the Office 365 and G Suite do? You have successfully created a website for your business and the next step is to get a professional email address. Even though many web hosting companies are providing free business email addresses, they are not offering the feature and functionalities what G Suite & Office 365 offer. Both Office 365 and G Suite offer a suite of productivity tools that let you perform common business tasks like creating documents, spreadsheets, and presentations in the cloud, and also allow you to collaborate with team members. These cloud productivity suites save a lot of money & time on maintaining software licenses, installations, running an IT department, and more. Since all your data is stored in the cloud, it is easier to access files from anywhere using any device. G Suite includes Gmail, Google Drive, Google Docs, Sheets, Slides, Calendar, Keep, Hangouts, and other Google apps that you probably already use and love while the Office 365 includes Outlook, OneDrive, Word, Excel, PowerPoint, One Note, Skype, and other Microsoft apps. How much you need to pay to use Office 365 & G suite? When you start to explore cloud-based productivity tools for your business, Pricing is one of the important factors. You must choose a product that fits your budget and also that offers the most value for the money you will spend. We’ll start by comparing the various plans, features, and pricing of G Suite & Office 365. The pricing of G Suite is simple and straightforward. There are only 3 plans. Note: For Business and Enterprise plans of G Suite, you will get unlimited cloud storage if you have more than 5 users otherwise you will get 1 TB of storage limit for each user. All the above plans are available in both monthly and yearly subscription models. The pricing of Office 365 is a little complicated, 3 plans for small and medium businesses and 4 plans for enterprise businesses. Unlike G Suite, all office 365 plans require annual commitments. Also, Small and Medium businesses plans are limited to 300 users. Note: The Business Essentials, Business, and Business premium are limited to 300 users and all Office 365 plans come with a 1 TB of cloud storage and 50 GB of email storage. Office 365 and G Suite offer solutions at competitive pricing which again makes it hard for businesses to decide the right one for them. However, there are other deciding factors. G Suite offers unlimited cloud storage with their business and enterprise plans while office 365 offers 1 TB of cloud storage with all plans including the business essentials plan which is not unlimited. Business Gmail uses the same technology as your free Gmail account. It will allow you to register a new domain or use your existing domain to create a business email for your users. G suite limits the Basic plan storage to 30GB for both emails and files. However, the Business and Enterprise plans offer you unlimited storage if you’ve more than 5 users. Creating professional emails with Office365 is easy and it offers to 400 email aliases. It uses Outlook as the mailing app and its desktop client is popular. You can use your office 365 email with other mail clients, and you can even receive those emails to your Gmail inbox. Businesses prefer cloud-based productivity tool for File storage and accessibility, since it is easy to store, edit, share and access your files anywhere and anytime. You can download the Google Drive app on your mobile devices, tablets, or desktop and store your files in the Drive. You can even make the files available offline. OneDrive app is available for desktop, mobile and it comes integrated with Windows 8 and above. You can sync files and share them easily. Using OneDrive app you can directly open the files on Microsoft Office and other default apps on your PC. Collaboration possibilities is a huge advantage of working in cloud-based productivity tools and it is one of the main selling points for both G Suite and Office 365. If you want to work on the same file, simply open up a document in a browser, draft, edit and share it with others for real-time collaboration. Both the G Suite and Office 365 makes the collaboration straightforward using their web apps. Let’s take a look at how G Suite and Office 365 handle the collaboration. G Suite’s focus is to make sharing and collaboration more effective and advantageous. The collaboration functionality in G Suite is easier than Office 365. The most used productivity tools of G Suite are Google Docs, Sheets, Slides, on which you can edit , leave a comment, make suggestions, review changes, and revert to an earlier version. Google Keep and Google Calendar allows you to create tasks, to-do lists, events, and timelines. Once created you can share it with your team and work together. Microsoft tries to recreate the appearance & functionalities of Desktop version on Office 365, but this made the office 365 UI little complicated as it needs to be online. Because of this, most people misunderstood that Office 365 users cannot simultaneously edit in Word/Excel/Presentation. Like G Suite, Office 365 also allows users to work on the same document at the same time and they can easily leave comments and suggestions. The Offline capabilities of Office 365 is still a deal breaker for many organizations, who have poor internet connectivity in their environment, while Google is cloud restricted. G Suite is packed with Hangouts for video conferencing and text messages. It can also be integrated with Google Voice, which allows you to make calls and send SMS in the US and Canada for free of cost. The maximum number of participants in a Google Hangout is 25 on ‘Basic’ and ‘Business’ plans, and 50 for the Enterprise plan. However, with the new Google Meet, 100 users can take part in a meeting and it is better in features and functionalities compared with Classic Hangouts like Dial in functionalities, call recording and a wide range of Reporting API. Check out feature comparison for a more detailed look at Hangout and Meet features. Office 365 users can use Skype for text messages and video conferencing. It is free for Skype-to-Skype video and voice calls, but to make local or international phone calls you need to get a Skype number and Skype credits. Skype for Business is not available with Office 365 Business and Business Essentials plans. It is only available for Business Premium and Enterprise plans. For video calls, Microsoft is more generous than Google, you can have 250 participants on most of the plans and it goes to a whopping 10,000 participants if you’re on an Enterprise E3 or E5 plan. For security, both Microsoft and Google work hard to protect their users from vulnerabilities. Round the clock, they monitor their servers and offer patches regularly as quickly as they found any loopholes in their infrastructure. Google trying to give the best security to its users. G Suite complies HIPAA, ISO 27001, ISO 27018, EY Point, and AICPA/SOC. G Suite is preventing all its users from Spam, phishing, and malware prevention and on the user-controlled side, the two-step verification requires an alternate code besides to their log-in credentials to access their files. Administrators can control the single-point sign-on of their users to unify access to other enterprise cloud applications and management of mobile devices.The data loss protection (DLP) allows administrators to protect sensitive information from being emailed outside. Microsoft is using service-side encryption technology to protect data at rest and transfer between the user’s device and Microsoft’s server. When the data is at rest, Microsoft uses file-level and volume-level encryption. While transit Inter Protocol Security (IPsec) and Transport Layer Security (TLS) is used. For selected plans, Microsoft uses Advanced Threat Protection (ATP) to filter spam, viruses, and malware out without having to set additional settings. Like Google, Microsoft also offers the same two-factor authentication to its users. They need to provide the code sent by text or phone call to log in to their session. Both Google and Microsoft offer 24/7 phone and Email support in English and also in other languages depending on the country. They provide an extensive online self-help knowledge base and there are various support forums available to get the answer for your questions. For complex enterprise/integration issues, you may need to reach out to an experienced third-party IT provider for assistance. G Suite and Office 365 are the great cloud productivity suites. They allow working from anywhere using different devices and enable your business to collaborate, store files online and easily share them. G Suite is a better choice for small business owners as it is much easier to use since you would’ve already used any of the google apps like Gmail, Calendar, Docs. Another advantage of G Suite is its storage, if you are on a basic plan, you can buy more storage, and with business and enterprise plans, you will get unlimited storage. If you want to work offline on your Windows or Mac PCs, then Office 365 is the one for you. Most enterprise-level businesses are preferring Office 365 as the most advanced users prefer to use the software features comes with the desktop apps.